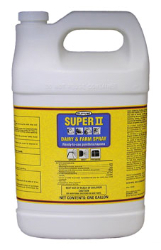 Super II Dairy & Farm Spray is a ready-to-use insecticide spray designed to protect livestock from lice, stable flies, horn flies, fleas, mosquitoes and gnats. A ready-to-use insecticide spray designed to protect livestock from lice, stable flies, horn flies, fleas, mosquitoes and gnats. For use on livestock. Contains two insecticides and two synergists for maximum effectiveness. Pyrethrins and Vapona insecticide combination provides quick knockdown plus residual kill. Piperonyl Butoxide and MGK264 synergists reduce the insects ability to resist insecticides. Can be sprayed directly on livestock. Provides residual control on cattle up to 48 hours. Can be used as a fogging spray. One ounce treats 1000 cubic feet, while most other competitive sprays require up to twice as much spray. Contains 44% more total active ingredient than C-EM-DIE. Contains petroleum distillate. To protect livestock from attack by fleas, spray the bedding and walls of the pen, cracks and crevices. Repeat the treatment frequently until adequate control is obtained. In a complete fly control program, these sprays should be used in combination with residual insecticides and sanitary measures. To develop a residual repellency to stableflies, hornflies, mosquitoes and gnats on dairy cows, apply one (1) to two (2) ounces to each animal for a three (3) day period. The spray should be applied with an hydraulic-type hand sprayer to ensure that the animal's entire body has been covered. Care should be used in spraying the legs, the belly and the shoulders. Avoid areas around the nose, the eyes and the mouth. Avoid wetting the hide. Spray in the same manner after two (2) days have elapsed and every second day thereafter, or when insects disturb the animal. Ensure that the teats and the udder are washed with warm water prior to milking. Calves should be sprayed lightly once a day instead of attempting to build up a residual repellency by spraying more heavily. For the control of lice on livestock, spray the animals with 2 oz. Immediately rub the spray into the hair, paying attention to the infested areas. Repeat as necessary, but not more than once every three (3) weeks. To kill flies, mosquitoes and gnats in the barn prior to milking, close all doors and windows and direct the spray toward the ceiling. The barn should remain closed for 10 to 20 minutes. Sweep up and destroy fallen insects. Repeat as necessary. Apply at the rate of one (1) ounce of spray per 1,000 cubic feet. Do not use the mist solution in areas where animals have received direct spray within eight (8) hours.